Today is wife’s birthday so tried to be a good husband and got here an old guitar. 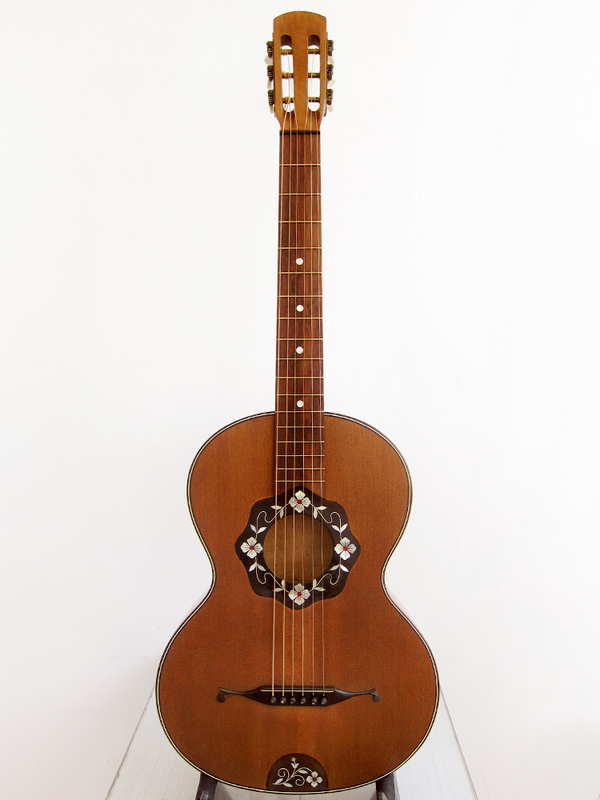 I found her a little Rondo, a mail order guitar built by Levin in the late 1950’s. I have actually never seen one of these before so I was quite exited when it arrived. It surely feels, plays, smells and sounds like a Levin. 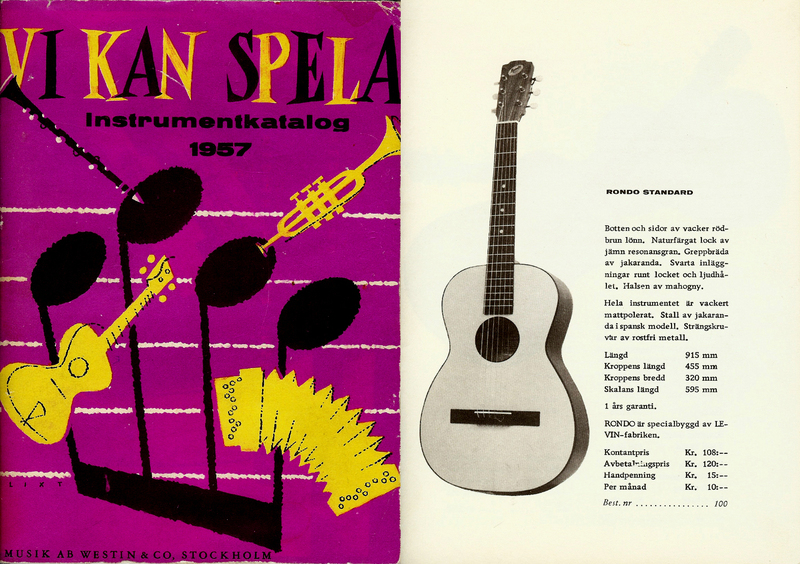 Rondo was made by Levin for Musik AB Westin & Co, a music store and publishing company in Stockholm with a large mail order business. 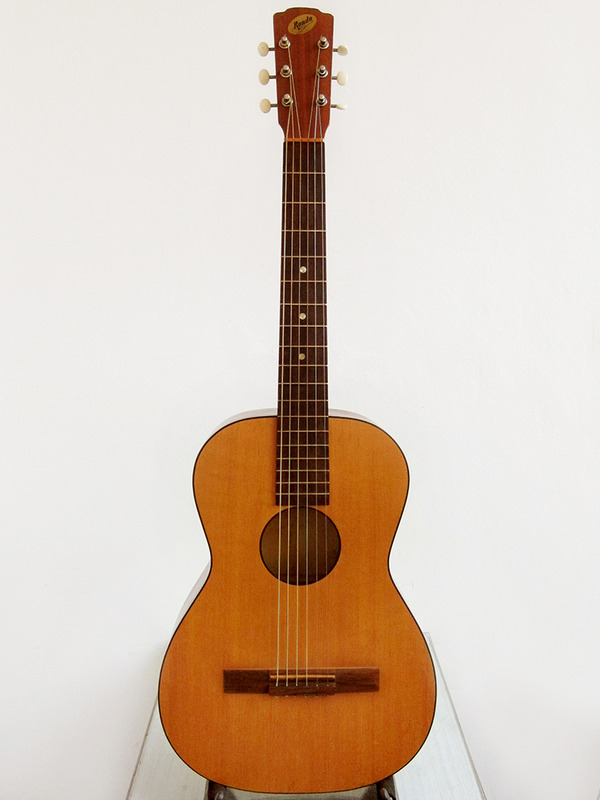 It looks pretty similar to a Levin 119 and was made for both steel and nylon strings, this was pretty common on smaller Levin guitars in the 1950-60’s. It’s a very nice little guitar to play and it has more volume and sounds sweeter than I expected, perhaps because it’s fan braced instead of ladder braced. My wife seemed very happy with it too when she got it this morning. It was in pretty good shape when it arrived. I had to glue a couple of small cracks, polish the frets, oil fretboard and machine heads and give her a good clean but that was it. The only problem was that this had to be done when my wife wasn’t around so I’ve been a guitar repairing ninja for the last week. I managed to find another a Ibanez Vintage, just like the Ibanez V 300 BS that I got for my friend Miki back in July, but this time it’s a Ibanez Vintage 637 BS. I’m not really sure what the difference is between the V 300 and V 637 because they feel, look and sound very much the same but I assume this one should be a bit better since the model number is higher. Unless they used the old 600-series number for them in 1978 like the used on the Concord earlier and then changed in 1979 to a 300 series. Either way it’s a beautiful and very well sounding guitar. This guitar is now sold. Back in May I found an old German parlour guitar of unknown make, well it later turned out to be a Sonora, but that opened up my eyes for these small beauties. It’s hard to compare them two since the first one had to be completely rebuilt and this parlour was playable when we got it, except for two small cracks in the top. 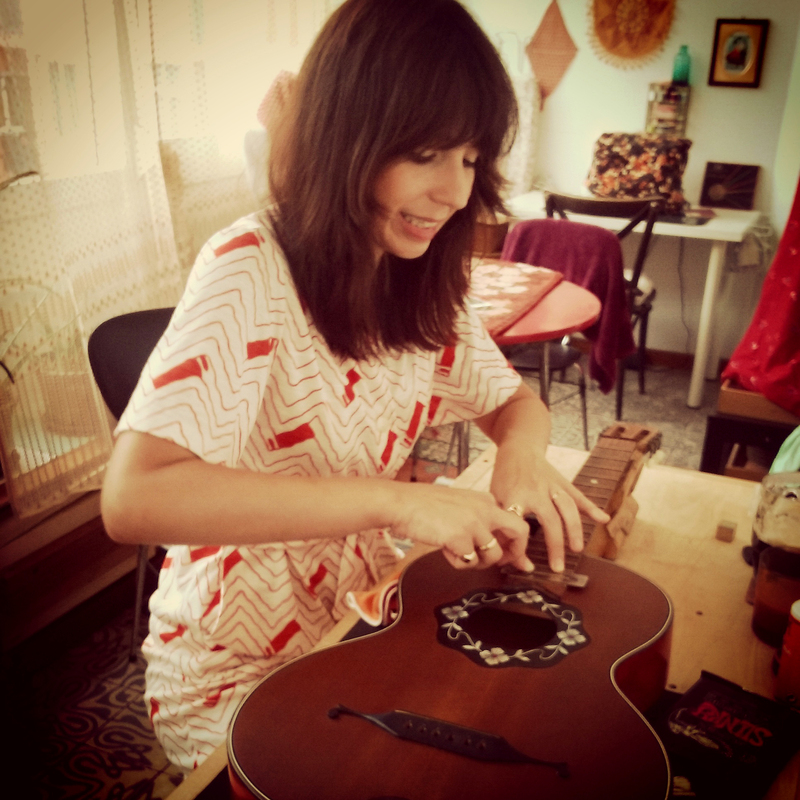 I actually got my wife to fix up her own guitar, it was about time she was introduced to what I normally do when an old guitar arrives. First she had to polish the frets, oil up the fretboard, clean the whole guitar, oil the tuners, ad some fish glue to the small cracks and clamp her up and then when she was ready, restring her. The little unknown beauty. There are no makers mark or any further info on this guitar. We just both fell in love with the amazing flower inlays and couldn’t resist her. 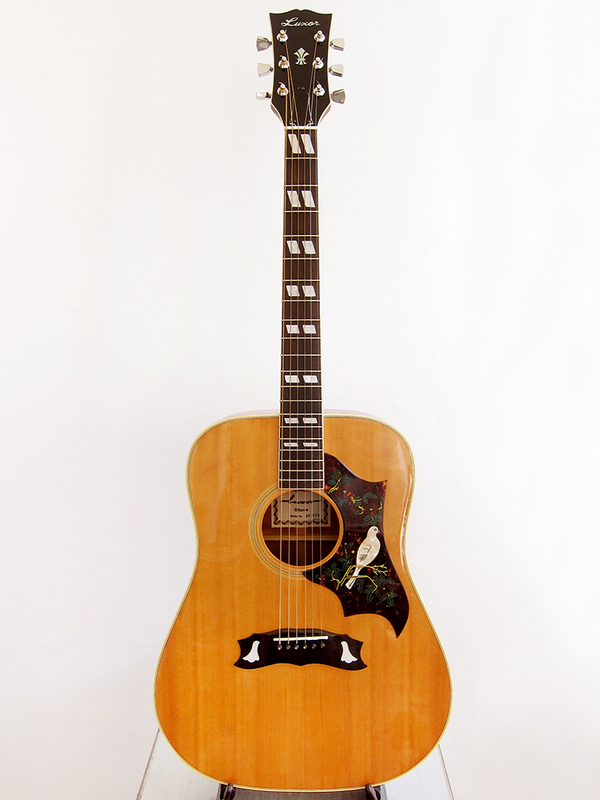 The 1970 Hagström HIII is now sold and is going to be sent off to Jose in A Coruña. I recently found a little Fuji F310, a 000-sized Japan made acoustic. 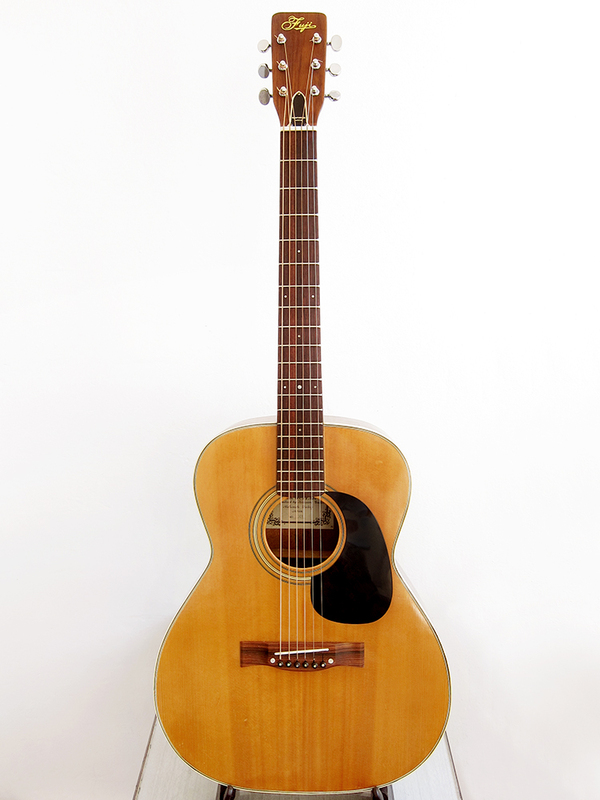 The guitar was made by Kurosawa guitar in the Matsumoku factory in the late 1960’s. It says Matsumoto factory on the label and that seems to have been the original name of the Matsumoku factory before they grew too big and had to move, the old Matsumoku factory was in the city of Matsumoto. It’s in great shape for the age and has a great tone, these folk sized Japanese acoustics are pretty hard to come by, especially here in Spain. It’s made with really nice looking tone woods, the rosewood back is beautiful and so is the fretboard. The neck is really fat and feels great, a bit like a 58′ Les Paul and if I needed another 000 I would have kept it myself but I have three Levin guitars in this size. I bought the Fuji F310 for my wife but her hands are too small for the neck and therefore it’s up for sale. A changed the bridge pins and put in a bone saddle, straightened up the neck and polished the frets. There was a pretty nasty dent on the back of the neck, close to the body, that I filled, painted and lacquered over. A few weeks ago I got myself my first Luxor guitar, just like C.G. Winner it’s a brand that you see a lot of in Germany but no one outside have ever heard of it. It’s a really well built Dove copy from the 1970’s in great shape, most likely made in the Matsumoku factory in Japan by Ibanez. What we know for sure is that Luxor was a made by Ibanez and imported by Musikhaus Otto Manfred Hack, Göttingen, Germany. 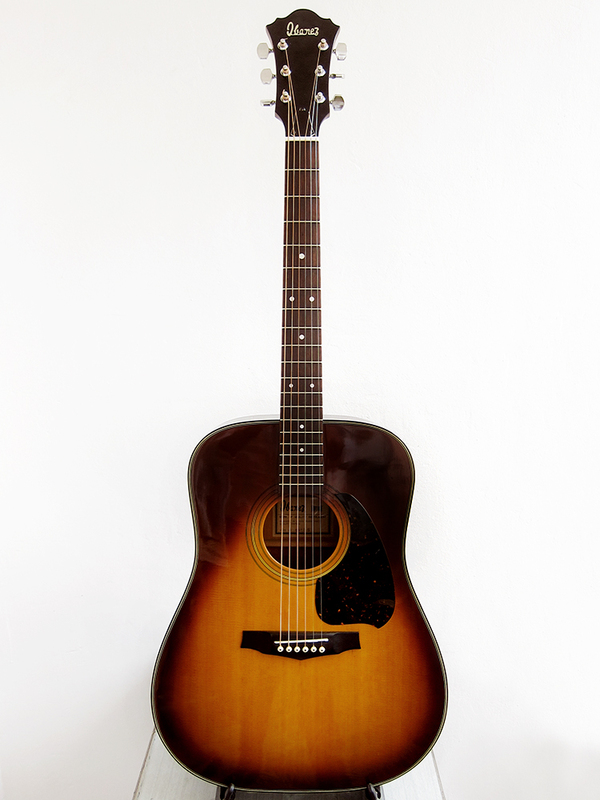 This was pretty common in the 1960-70’s that guitars, especially Ibanez, were imported without a brand name on them since it was cheaper and then the importer put their own chosen name on them, like Penco in the US, imported by Philadelphia Music Company, or Antoria or CSL in the UK, imported by Charles Summerfield Ltd, just to name a few. Penco, Antoria and Luxor are all linked to Hoshino Gakki, the owner of the Ibanez but they all claim to have been made in different factories, this is a bit of a problem with Ibanez since it’s just brand, not a factory. Ibanez produced guitars both in the Matsumoku and FujiGen factory, and probably in some others too, so it’s very hard to know what was made where. Ibanez and Cimar, a sub-brand of Ibanez, claims to have been made by FujiGen, while Luxor and a lot of other brands owned by Hoshino Gakki were made by Matsumoku. Having said that, the quality of this Luxor is made with Ibanez standards and not like a lot of the no branded inferior ones that Matsumoku mass produced in the 1970’s. Here you can read more about Japanese guitar brands. Either way, it’s a fabulous looking Dove copy, a pure joy to play and it sounds great. Unfortunately I managed to buy a couple of more guitars than I first intended over the summer so this Luxor 42-274 is for sale.